On your initial office visit, you can expect a thorough examination that will include orthopedic, neurological and chiropractic elements. X-rays may or may not be required, depending on medical necessity. Your initial examination may also include chiropractic and soft tissue manipulation. These will be followed by rehabilitative exercises to promote healing and reduce your symptoms. The goal of your first visit is to reduce your overall pain level. Not all patients receive chiropractic manipulations. We have a variety of choices and modalities to treat your needs and will discuss them with you prior to your treatment. I stand all day at work. How do I stop my back from aching? The proper position for standing prolonged in one place is to place one foot on top of an 8-12 inch platform. This will give dramatic relief to your lower lumbar spine via rotating your pelvis, thus less stress on your lower spine. I sit all day at work. How do I stop my back from aching? 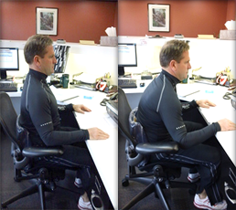 Sitting can be very detrimental to your cervical and lumbar portions of your spine. If you are in a slouched sitting posture, your pelvis is in a posterior tilt, putting more weight on the posterior aspect of the ischial tuberosities; your lumbar spine is in a very flat position; your chest is in a compressed state; and your cervical spine is in an anterior translation. From this position, it is very difficult to take a deep breath. When you reach forward from a slouched position, you are now bending from the lower back, increasing the pressure under your lower lumbar spine and your scapulas are protracted, adding stress to your upper thoracic and shoulder region. Compare that to the correct posture. Sit up straight and put a lumbar roll in the small of your back. Now your pelvis is more in an anterior tilt. Your weight is more on your thigh region. The scapulas are in a more neutral position, causing less strain on your shoulders. The cervical spine is more in a neutral position and it’s much easier to take a deep breath. Also, make sure you look directly into your computer while doing your desk work. Can too much texting be bad for my back? It’s the newest syndrome. Today’s generation spends a large amount of time bent over their phones, keeping the cervical spine in a constant state of flex. Any prolonged positioning like this will certainly result in pain. It’s becoming such an problem, there is even an application you can purchase for your phone that will beep to indicate that you are holding your phone in the correct position to ensure proper posture in your cervical spine. I think, however, that awareness of the issue and knowledge of the proper positioning is all that is needed to prevent this type of back pain. Sometimes called a manipulation, an adjustment is a precise procedure in which a chiropractor applies a specific corrective pressure to a specific place on your spine or extremity to restore normal function. It can also relieve associated muscle and nerve tension, improved balance and assist in healing. What causes the noise of the adjustment? Some techniques produce a popping sound which is simply nitrogen gases rushing in to fill the partial vacuum created when joint surfaces are slightly separated. Not all adjusting techniques performed at this office will produce this popping noise, often associated with the cracking of knuckles. Some chiropractic adjustments will make no sound at all. How long will it take until I feel better after an adjustment? Everybody heals differently. Most patients feel dramatic, instantaneous relief. Others may take several treatments before their body begins to respond. It really depends on your health status. Chiropractic care is remarkably safe. In fact, it is a conservative approach to your health that avoids invasive procedures or addictive drugs. Simply put, if it was not safe, my malpractice insurance would reflect that substantially. Does Dr. Elwert treat slipped or herniated discs? This is probably the number one reason patients consult our office, either via referral from other physicians, or seeking alternative treatment to relieve symptoms. Relief of symptoms is our first goal. The second goal is to place the patient on a rehabilitative exercise program to prevent the symptoms from re-occurring. What is the Toe Touch Test? Try this simple exercise next time you try to touch your toes. Simply rub the bottom of the foot with a stick, golf ball or rolling pin 30-40 times. Now try to touch your toes again. Your flexibility should certainly have improved. All you have done is release some of the restrictions and adhesions to allow your foot to dorsiflex more to a normal position to allow you to touch your toes. The sports hernia is a tear in the lower abdominal wall in the inguinal area. Unlike a classic inguinal hernia, there is rarely a significant tear that results in a bulge. Rather there is a gradual onset of pain in the lower abdominal area, usually beginning in the groin. Sports hernias are not traumatic in nature. There is no singular incident but rather a gradual progression, a growing pain progressing into abdominal pain. In reality, the sports hernia may be a secondary injury. In fact, sports hernias are noted in the reaction of the abdominal muscles to a groin injury or more specifically the reaction of the abdominal muscles to a change in the mechanics of the hip joint. In addition, it has become obvious that the abductor muscles of the hip have a secondary role. Two of the abductor’s are also weak hip flexors. Sports hernias are at near epidemic levels in two sports; soccer and hockey. What do hockey and soccer players have in common? One very crucial similarity. The recovery of the skating stride in hockey is a combination of hip flexion and abductors. Striking a soccer ball is the same motion. So what do these abductors/flexors have in common? They insert just below the abdomen, right in the area of the sports hernia. Asymmetrical range of motion, normally at the hip, may be another precursor to the sports hernia. There are numerous exercises for treatment. The best course of treatment revolves around soft tissue mobilization. Most athletes would recover well without surgery if they would actually take time to rehab. Instead, unnecessary surgery is almost used as a method of forced rest to allow healing to take place. The act of jumping and leaving the floor is not so much the problem. But what goes up, must come down, and it’s not always pretty when it does. Landing incorrectly, with the knees in an abnormal position, is a major cause of ACL injuries. So when addressing ACL prevention, we start with squat progression exercises and progress into landing progression exercises with single and double legs.